Frosty and his friends have taken a tumble and ended up in a giant snowball cake! Here’s how we rolled up this spherical snowy centrepiece. Made using our Medium Hemisphere Cake Pan. Preheat the oven to 180˚C/Gas 4. Grease and flour two Medium Hemisphere Cake Pans. Cream the margarine and caster sugar together until pale and fluffy. Gradually add the beaten eggs, mixing well between each addition, then add the vanilla extract. Divide the mixture evenly between the prepared cake pans, level out and bake for 60-70 minutes. Your cakes should be springy to the touch, and a skewer inserted into the centre of each should come out clean. Leave in the tins until completely cool. Once cool, trim off any excess from both cakes and trim a small amount from the bottom of one of them. Spread a little frosting onto this flat base and place on a cake board. Add a little more frosting to the top of this bottom cake and add the top cake to make a sphere. Cover the whole of the sphere with a thin, smooth crumb coat of frosting. Once completely covered, place in the fridge for about half an hour to set. Lightly dust a work surface with icing sugar and roll out 800g of the ready-to-roll icing to a circle at least 30cm across. Place onto the cake and, using your hands, gently smooth from the top downwards before trimming any excess from the base. 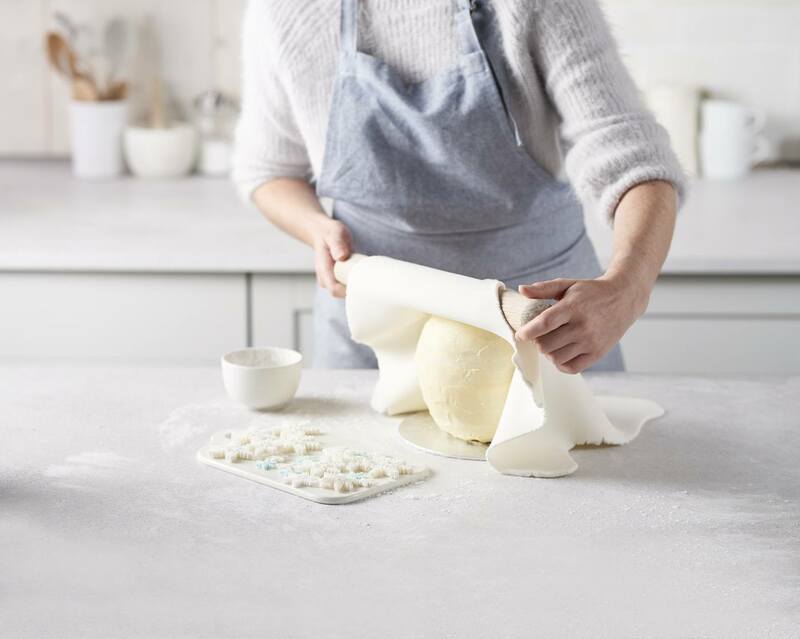 To decorate, you will need the remaining 200g of white ready-to-roll icing, plus small amounts of ready-coloured icing or white icing coloured using food colouring. To make the snowmen figures, push ready-to-roll icing into the mould, starting with small amounts of coloured icing for the detail – black for the buttons, eyes and hat, orange for the nose red and green for the hat trim, red for the robin’s breast and brown for his body – and finishing with white icing for his body. 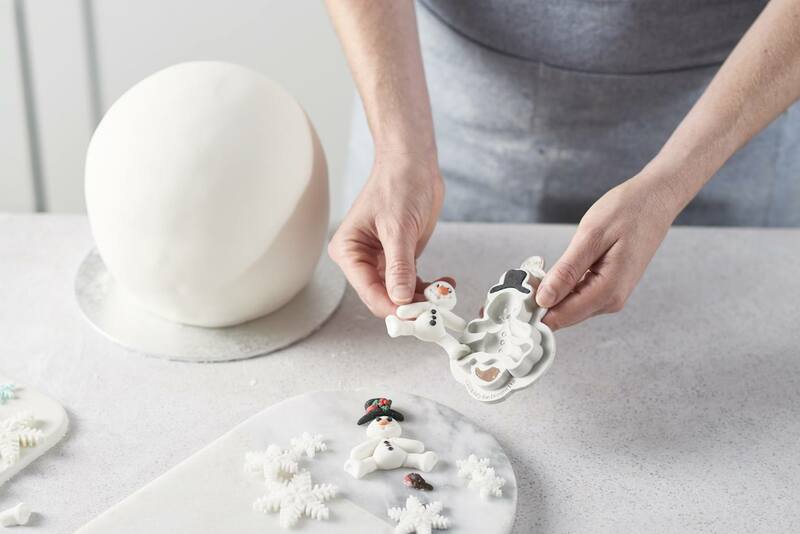 For the snowflakes, roll out icing and stamp out shapes in all three sizes – we dusted the smallest size with blue edible lustre to get a sparkly effect. 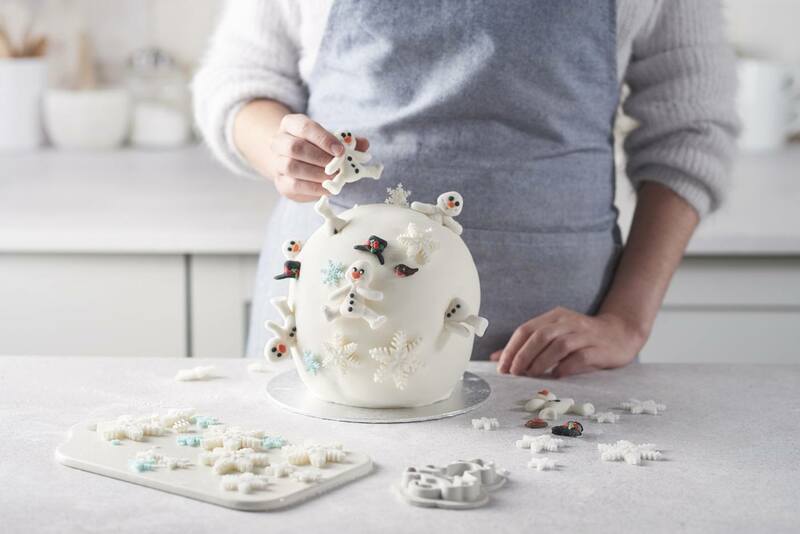 Attach your snowmen and flakes to your bake using a little edible glue or frosting, cutting some of them up so it looks like they’re partly inside the ‘snowball’.